As it turns out, the three perpetrators who decided to disregard the UFC’s strict Athlete Outfitting Policy at last month’s UFC on FOX 17 event were all lightweights. Former #1 contender Nate Diaz decided to rock some jeans to weigh-ins, then-top contender Donald Cerrone slapped a patch on his fight trunks, and now we have learned champion Rafael Dos Anjos (pictured) was also fined a “significant” amount of money for donning an Evolve MMA t-shirt before tipping the scale at weigh-ins. MMAFighting.com reported Dos Anjos’ penalty. Last week, UFC Senior Vice President of Global Consumer Products Tracey Bleczinski told MMAjunkie.com that they had fined three unnamed fighters undisclosed amounts of money for violating their Athlete Outfitting Policy at the December 19 event. Bleczinski added that they sent another 12 UFC fighters warning letters for non-compliance issues since Reebok became mandatory attire during fight week. 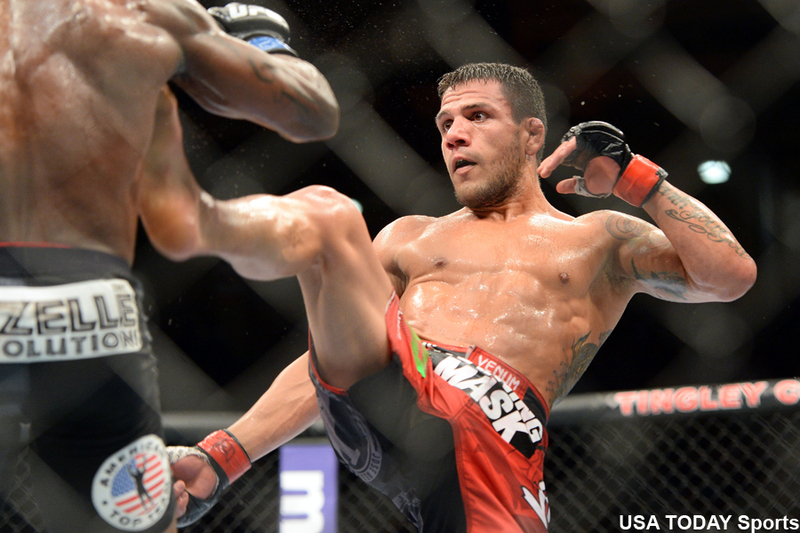 Dos Anjos captured the lightweight title by dominating Anthony Pettis last March. December’s first round TKO disposing of Cerrone marked his first title defense due to a knee injury. It was also the first time the Brazilian was forced to wear Reebok during fight week. As the UFC lightweight defending champion, Dos Anjos would have made $40,000 from Reebok had he followed the rules for his bout against Cerrone. It is unknown what the UFC intends to do with the money that’s being withheld from the three fighters.